Mini USB Port On Your Cell Phone – Now Useful! Our smartphones are now smart enough to support peripheral devices through their micro-USB ports, but tech companies have not been smart enough to make use of this feature. 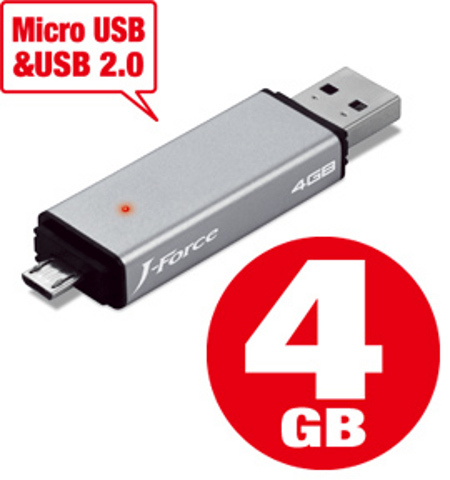 JForce leads out by introducing the JForce JF-UFDP4S, a flash drive with a micro-USB connector on one side that enables you to connect it with Android mobiles. You can transfer files to and from your mobile using this flash drive. The most unique feature with this flash drive is its dual plug – on the other side of the flash drive is a type-A connector so you can connect it to your computer. You can use the JForce flash drive with your computer as well as your tablets and smartphones – transferring files between your computer and your smartphones will now be easier than ever. Once you start using this device as your default flash drive, there will now be no need to carry extra USB cables to sync files between your smartphone and your laptop. The power consumption of the device during file transfer is 250mA maximum and will not drain your smartphone’s battery. The drive is currently compatible with about 10 Android smartphones supporting USB OTG (On The Go), so it will be another cycle before other smartphones are equipped with USB OTG. Also, while most smartphones support memory up to 16GB, the JForce USB drive’s capacity is just 4GB and the transfer speed hits 50MB/s tops. Still not bad for a cool USB that costs $25. This entry was posted in Articles, USB Flash Drives, USB Gadgets, USB Stick, USB Storage Drives and tagged JForce, JForce JF-UFDP4S, JForce JF-UFDP4S USB Flash Drive, JForce USB drive, JForce USB OTG, Micro USB, Mini USB 2.0, Mini USB port on Cell Phone, USB OTG, USB with Micro USB Connector. Bookmark the permalink.